To get the juices in your brain flowing (or to drain them even more if you have spent the whole weekend agonizing over your taxes as you frantically try to get them done) I have a life changing question to ask you. Ok this question might not be life changing for you but it will be for me and I would like to hear your thoughts. So here goes. Up until now, every single recipe I share, I create a *fun* title for the blog post. Usually something related to what I write about for that day (like the title above). But for more formal, informational posts or how-tos I always have a direct formal title like, In Season: Arugula or How-To: Valentine’s Day Candy Cards. 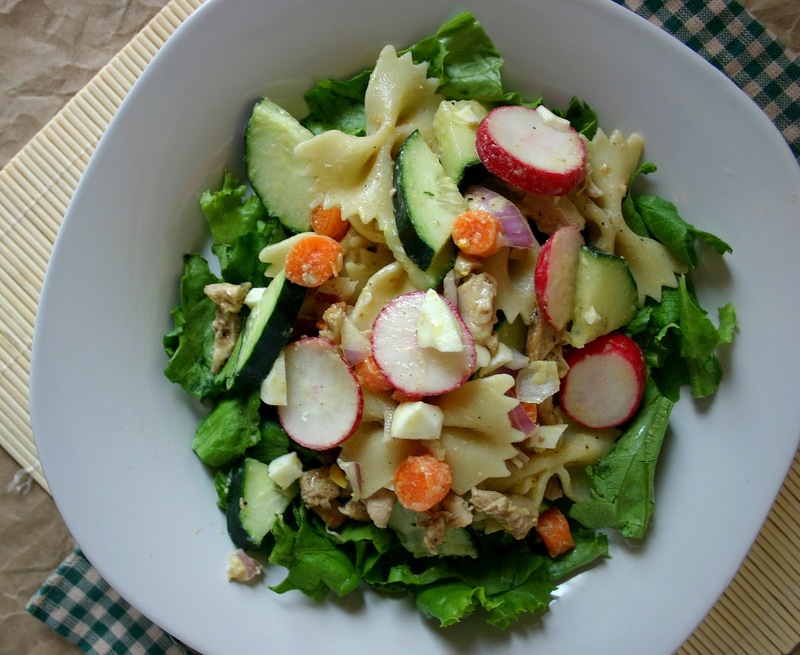 But here is my question, do you as a reader prefer blog post titles to be the title of the recipe for the day, for example today’s would be Spring Chicken and Pasta Salad, or do you find the *fun* *creative* titles interesting and amusing? I have always had a good time coming up with the creative titles and have always thought that they are a great way to get your interests perked. However, titling the blog posts based on the title of the recipe I think would make it easier for you and me both to search for recipes we need. And this (not my taxes), people, is what has caused many a sleepless nights for the past few weeks! So, my friends, what do you think? Creative and witty blog titles? Or simply the title of the recipe? 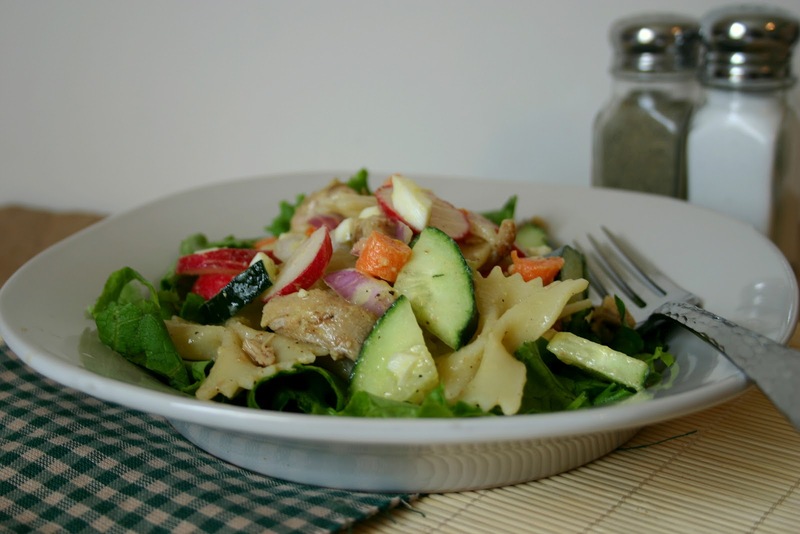 Well speaking of recipes, today’s is a simple yet fresh pasta salad. I have my Greek Pasta Salad that I absolutely love and make often for events. But my Greek version uses things like olives, capers, and sun-dried tomatoes, all things I love dearly. But I what I like about this springtime pasta is all the fresh spring veggies. Radishes, carrots, cucumbers. I think even some grape tomatoes or bell peppers would be nice too. I also liked serving this on a bed of chopped romaine lettuce for added freshness. While I did add the chicken to this (so that Eric would eat it) I totally think this would make a great vegetarian meal! Hard boil the eggs by placing them into a saucepan in a single layer. Fill with water to cover the eggs by 1 inch. Cover the saucepan and bring the water to a boil over high heat. Once the water is boiling, remove from the heat and let the eggs stand in the hot water for 12-15 minutes. Pour out the hot water, then cool the eggs under cold running water in the sink. Peel once cold. Fill a large pot with lightly salted water and bring to a rolling boil over high heat. Once the water is boiling, stir in the bow tie pasta and return to a boil. Cook the pasta uncovered, stirring occasionally, until the pasta has cooked through, but is still firm to the bite, about 12 minutes. Drain well in a colander set in the sink, and rinse with cold water. Meanwhile, heat a non-stick pan over medium-high heat. Add chicken, seasoned with salt and pepper, and cook until no longer pink inside, about 4 minutes per side. Remove the chicken from the pan, and set aside to cool. Cut the chicken into bite-size pieces. Slice the eggs. 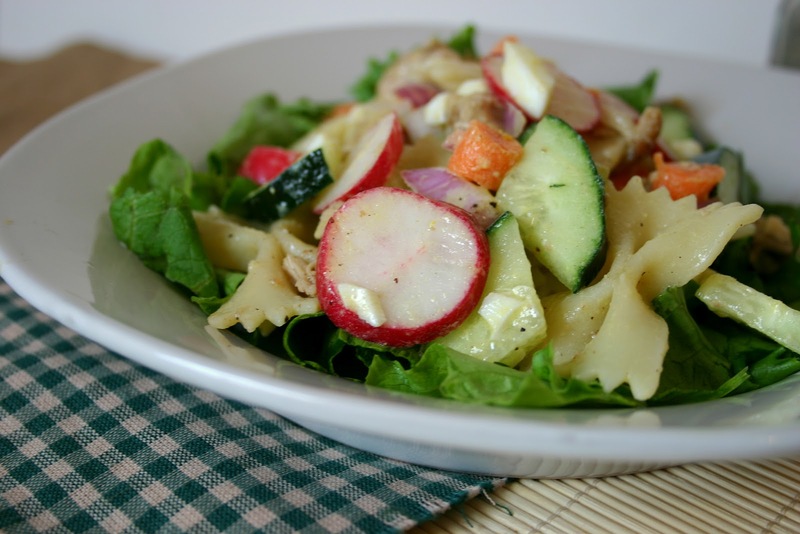 Combine the cooked pasta, chicken, eggs, cucumber, radishes, carrots, and red onion in a salad bowl, and pour the Italian dressing over. Toss lightly to mix. Serve as is or serve on top a bed of romaine lettuce. Note: Pasta salad can be served at room temperature or chilled. I keep mine as just the title of the recipe for a few reasons. First, I'm not good at coming up with creative titles. 🙂 Second, it's much easier for me to find recipes or posts with the title. Back when I first started blogging, I didn't use the recipe title, and those posts are a bit harder to sift through. But regardless, I could totally gobble up this salad!